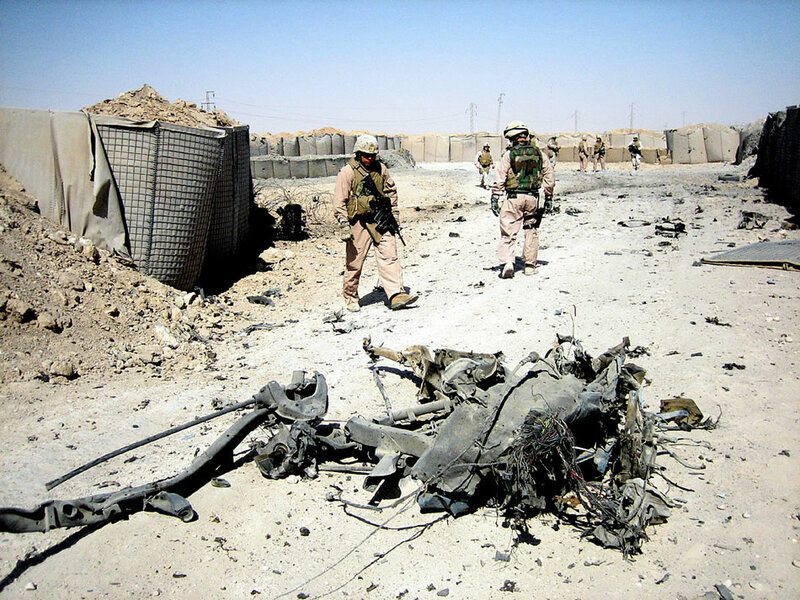 U.S. Marines from 1st Battalion, 7th Marine Regiment and Iraqi soldiers inspect the wreckage left from a suicide truck bomber against one of the Marines� forward operating bases along the Iraqi-Syrian border, July 13, 2006. All that remains of the incident is a burnt chassis. The car bomb was described by Lt. Col. Nicholas F. Marano, the battalion�s commanding officer, as possibly the largest IED attack against Marines deployed near the border. One Marine, 24-year-old Lance Cpl. Lawrence F. Hiller of Austin, Texas, is credited to stopping the suicide bomber from breaching the Marines� outpost and causing further damage. Hiller�s actions quite possibly saved lives, according to Marano. �Had Lance Cpl. Hiller not been alert at his post, this incident could have easily become catastrophic,� said Marano. Since the battalion arrived here four months ago, the Marines have encountered mostly IED attacks, they say. Firefights between insurgents and Marines in this area have become rare since a large-scale offensive operation was launched in November 2005 to hamper the terrorists� control of the area. Back then, a previous Marine unit fought face-to-face daily with enemy forces during the four-week operation, which resulted in an estimated 150 insurgents killed or captured.